Since I love all Asian foods, especially Vietnamese, Japanese and Korean, I was very excited to try out Nom Nom Burger which opened fairly recently across from Park Road shopping center on Woodlawn Road. We met and talked with one of the founding partners, Tung Ngo, who is very energetic, personable and dedicated to making this creative concept work. We visited on a Tuesday night and it was "kids eat free" night for kids age 10 and under with purchase of an adult meal. Once our little one is old enough to actually eat his own meal (it won't be long!) this will be a great place to go. There were lots of families as well as some couples and groups of friends. The dining room has a neat waterfall that all the kids were fascinated by. Finding myself missing Korean food the most since I moved back to Charlotte, I knew we had to try the Kalbi Burger. It includes kimchi, a fried egg, sesame roased nori (seaweed), spicy aioli and roasted garlic. Wow. This was a fantastic burger. Part of the excellence is because of the meat that is used, which is Sterling Silver ground beef, but the flavors in the Kalbi really make it top-notch. The signature Nom Nom burger was also good - it includes Provolone cheese, sauteed Shiitake mushrooms with mirin, caramelized onions with ginger orange marmalade and mayo. 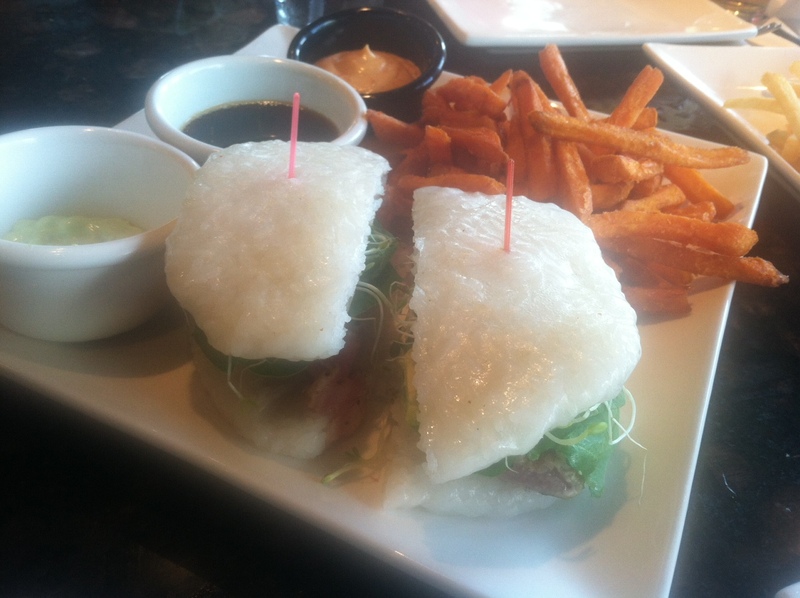 It is really a toss-up with the Kalbi but my favorite item we tried is the Ahi burger - a thick piece of Ahi tuna seared and put on a sushi rice "bun" with avocado, spinach and sprouts with both wasabi and citrus soy dipping sauces. 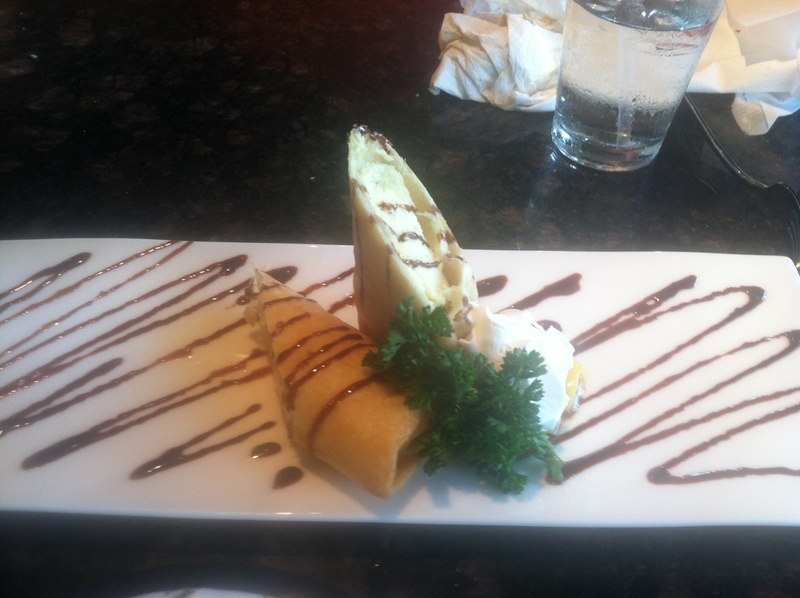 Sushi lovers - you must try! We also tried the calamari, which was light, spicy and delicious. The shrimp chips (a Vietnamese item) were really tasty, but regular fries (can be made garlic or jalepeno) as well as sweet potato fries are also options. For dessert we wanted to try the Honey Bunz with ice cream but since they were unavailable we had the fried cheesecake "Xango", which was good. There is a Ben & Jerry's right across the patio so that is another option if you have any room after trying the delicious offerings at Nom Nom. Next time I'm trying the Banh Mi Burger (it's actually chicken) - if I can keep myself away from the Ahi! There are also more burger options (including a plain one for the non-adventurous), chicken sandwiches, fish sandwich/tacos, salads, noodles and even a veggie burger on the menu so vegetarians and even vegans should be able to find something. We will see you soon, Nom Nom! Ahi Burger - for the sushi lover! Nom Nom Burger with Shrimp Chips. Awesome biscuits. Seriously the best I have ever had with delicious sorghum butter. While Malika of Atlanta Restaurant Blog was here in town, we also had the opportunity to check out Block & Grinder. I was psyched to try this place since I missed the media event they held prior to opening. Block & Grinder is unique in that in addition to being a full-service restaurant and bar, there is also a butcher counter where you can purchase meats to cook at home. The restaurant focuses on premium beef as well as natural, organic meats and wild game so carnivores will be in heaven. However, there are options even for vegetarians including an "anti-burger" made from lentils and the house-smoked salmon is sure to please any pescatarian as well. We had a lovely Sunday brunch here and we were table to try a good portion of the brunch menu. The above biscuits were outstanding and everything else was very good. My favorite dishes (although very hard to choose from the items we tried) were the house smoked salmon - my son's first taste of smoked salmon and he loved it - and the corned beef hash. The coffee (French press) was also wonderful. As of July 2013 Sunday brunch is no longer being offered as there is a high demand for cooking classes and private events during that time. However, as noted here, many of the brunch items are available on the lunch and dinner menus. House smoked salmon with cornmeal cake. Shiitake and Gruyere Burger - fantastic flavor and great fries. This is also available for lunch and dinner. Corned beef hash with egg. Cute decoration and the famous butcher counter. More neat butcher tools on display. Full bar. I didn't sample any alcohol this visit but the cocktail offerings sound fantastic! I look forward to returning to try the lunch and dinner menus. The pork belly, duck and quail options sounds particularly enticing and I'd wager this would be a great choice if you want a good steak.